Greatly increasing contrast when working in black and white, this 67mm Red 25 Filter from Formatt-Hitech is used to significantly darken cool and blue tones in order to heavily emphasize clouds and produce more dramatic skies. 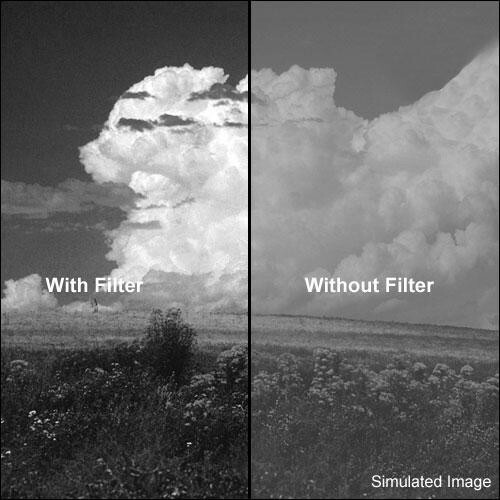 In addition to being ideal for landscape use, this filter is also well-suited to infrared photography and can be used to make color separations with blue and green filters. There is an approximate 8x filter factor with this filter, requiring an increase of 3 stops for normal exposure. This filter is constructed from Schott glass to maintain high image clarity and color fidelity, and it features a lightweight yet durable aluminum filter ring with 67mm front threads. Red filter provides the same effect as a Wratten 25 contrast filter, and helps to noticeably darken blue tones while lightening warm orange and red tones, when photographing in black and white. Commonly used for landscape photography to emphasize and darken blue skies and give clouds more visual depth. Also used for infrared photography and can be paired with 47 blue and 61 green filters for color separation work. Filter factor of 8 requires approximately 3 stops of additional exposure to maintain normal results. Box Dimensions (LxWxH) 4.3 x 4.1 x 1.2"